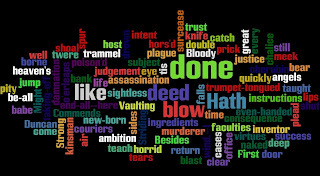 The first podcast deals with Macbeth's soliloquy which starts Act I scene vii, 'If it were done ...', analysing the speech and suggesting why this is the most important moment in the whole play. (The Wordle at the top of this post is composed from the words of the speech - since we've used Wordle a lot over recent months, we'd like to recommend voting for it in the Webby Awards - register here). Next week's podcast will be on Lady Macbeth.